Elderberry is a rich source of powerful anthocyanins for a strong immune response. Vitamin A helps boost the body's natural resistance. Vitamin C is a powerful free-radical fighter. Vitamin D helps maintain a strong immune defense at a cellular level by regulating T-cell activity. It is also one of the nutrients most often lacking in many diets. Other Ingredients: dicalcium phosphate, microcrystalline cellulose, croscarmellose sodium, stearic acid, aqueous film coating (purified water, hydroxypropyl methylcellulose, glycerin), organic rice bran extract, silicon dioxide. Recommended Use: One tablet daily. If additional support is needed may increase to 3-6 times per day, for up to 7 days. Q: Should I take ViraPro every day, or only for a limited time? 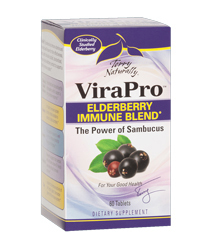 A: You can take ViraPro each day to support your immune system. However, if desired, you can double the dosage for a brief time and then go back to your regular regimen. Q: What advantages does freeze-drying give to elderberry extract? A: Drying is an ancient process used to preserve food. Unfortunately, the nutritional content in foods can be drastically altered or reduced when dried conventionally. This is why a freeze-dried elderberry extract is superior. The absence of water combined with the low process temperature stops cellular deterioration, enzymatic activity, and microbiological reactions. Freeze drying retains the highest level of antioxidants, anthocyanins, and other components and has the longest shelf life of any known drying process. Freeze-drying the elderberries concentrates the dynamic power of the fruit into a convenient, standardized extract. Q: Why do you use elderberry grown in Austria? A: The reason ViraPro™ features Austiran-grown elderberry is because this variety produces a deep purple fruit that is especially rich in anthocyanin content. In fact, Austria is a center of elderberry production in Europe because of its combination of growing season, climate, and superior harvesting and processing techniques. Q: Why do you use the retinyl acetate form of vitamin A instead of beta-carotene? A: The retinyl acetate form of vitamin A is used in ViraPro™ because it is the form proven to provide reliable immune support. While beta-carotene is a valuable nutrient, it is a “pro-vitamin A” which means that while it can turn into vitamin A in the body, it doesn’t necessarily mean that it will.